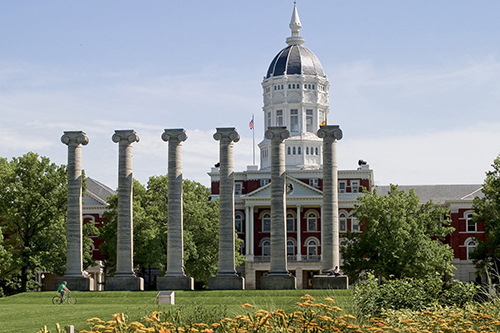 The University of Missouri was founded in 1839 as the first public university west of the Mississippi River. Today, with an enrollment of more than 31,000 students, MU students represent every Missouri county, all fifty states, and 120 countries. Owing to its exceptional teaching, research, and scholarship, MU is one of only sixty public and private U.S. and Canadian universities holding membership in the prestigious Association of American Universities. Mizzou has more than 300 degree programs, through eighteen colleges and schools, including one of the oldest Honors Colleges in the US, and is one of only four public universities nationwide with a medical school, a research reactor, veterinary medicine college, and a law school on the same campus. Graduate programs, professional schools, and the discovery of new knowledge through research add unparalleled value to an MU degree. The university’s nationally prominent faculty bring their discoveries into the classroom, publish more than 1,600 books and scholarly articles each year, and spend $288 million annually on research. Students benefit from hands-on learning, ranking in the top ten universities for undergraduate research and artistry experiences, while also contributing 250,000 hours of community service annually, and taking advantage of a large collection of study abroad programs. Supporters worldwide invest in MU by making private gifts for scholarships, academic programs, facilities, and life-changing research. Thousands are participating in the university’s $1.3 billion Mizzou: Our Time to Lead campaign to endow resources for our students’ and MU’s future. A campus renaissance is underway, with new residence halls, renovated academic buildings, and our ongoing commitment to our status as a campus-wide botanic garden and environmental stewards. MU’s 1,262-acre main campus features many university buildings listed on the National Register of Historic Places, nearby research farms, an award-winning recreational center, and three hospitals. The University of Missouri is currently seeking its first class of Stamps Scholars. 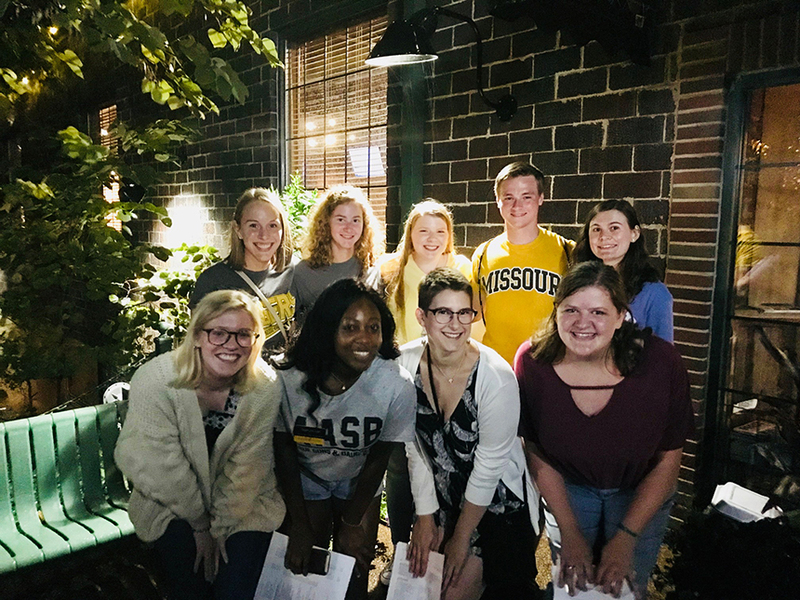 The Stamps Scholars at the University of Missouri will receive an extensive set of benefits: full tuition (in-state or out-of-state), fees, standard room and board, and books, all up to the full cost of attendance. All Stamps Scholars will also be members of the prestigious Honors College, and will receive, in addition to their scholarship funding, $16,000 over four years to support educational enhancement activities—research, artistry, study abroad, professional conferences, and more. Stamps Scholars will take part, as a unique cohort but also collectively with other MU Scholars & Fellows groups, in co-curricular and extra-curricular programs. These include special symposiums, guest speakers, semester trips to centers of research and artistry, study away programs, professional and leadership development workshops, and residential programming. Scholars will be assigned a special mentor and advisor and will also work closely with Honors College faculty. As members of the Honors College, all Stamps Scholars will enjoy priority registration, the Honors Learning Community, and an additional academic advisor. Any applicant who has applied and been accepted to the University and Honors College by November 1, with a 32 ACT or higher and at least a 3.5 core GPA, will automatically be invited to apply for the Stamps Scholars program. Any student who has been accepted by December 1 may apply without an invitation. Applicants must submit an additional essay, resume, and a detailed explanation of their academic career, which will be will be used to choose the finalists. Scholar finalists are invited to campus for an all expense-paid weekend in early February, where they will be treated to a full campus and Honors College experience, as well as sit for an extended one-hour interview, meet with students and faculty, and participate in several academic and social events. The selected recipients will then be required to participate in a Skype interview with a member of the Stamps Family Charitable Foundation, before being officially awarded the Stamps Scholars designation.